Project obstacles and solutions: The town of Fairmount, Indiana has a combined sanitary and storm sewer system. In large rain events, raw sewage was released into Back Creek. It was estimated that this took place about 60 times annually. The Environmental Protection Agency and the Indiana Department of Environmental Management mandated that towns and cities with combined sewers had to come up with an approved plan that remediated the problem. 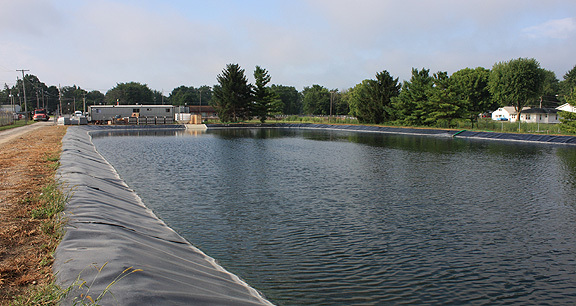 Fairmount's plan increased the capacity of the wastewater treatment plant to compensate for large rain events. Bowen Engineering was hired to design and build an addition onto the current wastewater treatment plant. This included constructing a new million gallon combined sewer overflow holding pond with a return sludge pumping station and two new clarifiers. Key to holding water in these systems is impermeable concrete walls. IMI QC/QA designed a mix that included crystalline water to hydrate the cement in the mix. Unlike topical sealers, concrete mixed with a crystalline admixture becomes sealed throughout the entire batch of concrete. Pores in concrete occur as excess bleed water is escaping during curing. Crystalline admixtures chemically attach to the water molecules and harden in these pores, forming a waterproof bond. IMI supplied concrete for 5,000 yards of concrete for these projects.